Protests continued Monday in the United States against the election of billionaire real estate mogul Donald Trump as the country's new president come January. Hundreds of students peacefully walked out of classes at a high school in Los Angeles and one in suburban Washington, following a night of more street protests in major U.S. cities. But the Sunday night demonstrations were smaller than those in the immediate aftermath of the Republican Trump's stunning upset of Democrat Hillary Clinton last week. "I know people weren't prepared for us to win," Trump's campaign manager Kellyanne Conway said in New York. But she added, "We should really focus on the will of the people." She called on President Barack Obama and Clinton "to say to these protesters, 'This man is our president.'" Kellyanne Conway, campaign manager for President-elect Donald Trump, talks with reporters as she arrives at Trump Tower, Nov. 14, 2016, in New York. Both Obama and Clinton last week called for national unity to give Trump a chance to govern when he takes control of the White House January 20, but have not spoken publicly about the subsequent demonstrations protesting the outcome of the election. The size of the demonstrations in major cities Sunday night numbered in the hundreds of people instead of thousands, as had been the case in earlier protests. 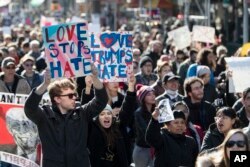 In New York, more than 1,000 people marched to Trump's home, the iconic skyscraper Trump Tower in Manhattan. A Chicago building with the same name was the focus for a smaller crowd of protesters Sunday as well. In San Francisco, several hundred people met to protest Trump in Golden Gate Park, and on Sunday night a group marched down the city's Market Street. Across San Francisco Bay, hundreds gathered in the city of Oakland to form a human chain around the 5.5 kilometer Lake Merritt. Hundreds of people also protested in Philadelphia, including a march to the area in front of Independence Hall where the country's founders debated and signed the Declaration of Independence and Constitution. Clinton, a former U.S. secretary of state seeking to become the country's first female president, and Obama campaigned at the same spot the night before the vote. Demonstrators march up 5th Avenue during a protest against the election of President-elect Donald Trump, Nov. 12, 2016, in New York. The demonstrators, many carrying signs saying, "Not my president," and "Love trumps hate," are protesting Trump's plans to deport undocumented immigrants, his lack of belief in climate change, his comments about Muslims and vow to appoint Supreme Court justices who oppose abortion rights. In an interview that aired Sunday night, Trump said Americans have nothing to fear about his presidency. Told that some of his supporters were harassing Latinos and Muslims who opposed his candidacy, Trump said, "I am so saddened to hear that. And I say, 'Stop it.' If it -- if it helps, I will say this, and I will say right to the cameras: 'Stop it.'" Trump wrote Friday on Twitter that he loves that there are small groups who have a passion for the country and predicted, "We will all come together and be proud!" Still others have criticized those rallying against Trump. A Facebook group about a protest planned for Friday in New York drew such comments as, "You're not accomplishing anything" and "Get a life people." Conway, on NBC's Meet the Press, said Sunday, "I just know that had he lost the election, as everyone I think - including the media - was expecting and these were Trump protesters, everybody's hair would be on fire asking them to accept the election results and do a peaceful transition in our government. He said he'd be the president of people who hadn't supported him, too. And they should think about that and give him a chance." Clinton said in her concession speech last week that those who believe in America must accept the election result and look to the future. "Donald Trump is going to be our president. We owe him an open mind and the chance to lead," she said.